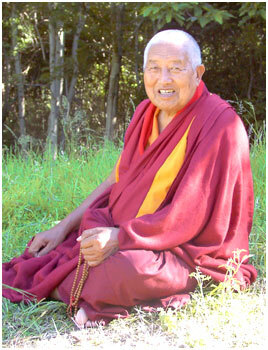 "His Holiness Lungtok Tenpei Nyima is the world-wide spiritual leader of the Bön religion of Tibet. He was born in Amdo, in the far eastern region of Tibet in 1927 and became a monk at the age of eight. At 26, he printed the Bönpo scriptures, a set of over one hundred books which is called the Kangyur, from wood blocks kept by the king of Trochen Gyalpo. At the time of the conflict against the Chinese in 1959, he fled on foot from Tibet to the border of Tibet and Nepal, then to Nepal and finally to India". Indeed an excellent Bon master.